Cameroon - As global demand for palm oil has grown in recent years, so has consumer concern over deforestation caused by expanding plantations. In response, the industry devised systems for certifying “sustainably produced” palm oil, but they haven’t been as effective as expected. Certification systems, such as the Roundtable on Sustainable Palm Oil, aim to address the environmental, social and economic factors that are commonly considered the three pillars of sustainability. The idea behind certification is that palm oil produced according to certain standards can command a higher price in the market, creating an incentive for growers to implement measures that will ensure sustainable production systems and notably reduce deforestation. But global certification falls short, because it takes a one-size-fits-all approach to a complex industry that varies not only between countries, but also within countries and among types of producers, according to a new study by researchers from the International Center for Forestry Research (CIFOR), the French Institute for Sustainable Development (IRD), and the French agricultural research center CIRAD. “Certification guidelines tend to be very generic, because they try to embrace all issues, all dimensions and the entire supply chain, providing recommendations for management and key practices,” says Cécile Bessou of CIRAD, who led the study. The study, undertaken as part of the Sustainable Palm Oil Production (SPOP) project supported by ANR, focused on oil palm production in two districts of Sumatra, in Indonesia, and in rural areas in Cameroon. Besides the wide variety of palm-growing scenarios, the researchers found that there is no consensus about the perceptions and meaning of “sustainability” or about when a forest is considered intact and when it is deemed degraded. That complexity makes certification complicated. Adding to the complexity of the palm oil sector is the fact that even “small-scale palm growers” do not fit into a tidy category. “Until recently, some people had the simplistic idea that on one side you have big, multinational agroindustries, and on the other you have poorer smallholders, who have one or two hectares of palm, and who don’t have much voice,” says Pablo Pacheco of CIFOR. Smallholder oil palm growers have different kinds of links with company plantations and intermediaries and benefit in different ways from oil palm expansion. There are also a significant number of medium-size companies and a growing number of local investors who are expanding oil palm plantations. The oil palm industry in Indonesia and Cameroon illustrates this heterogeneity, says Patrice Levang of CIFOR-IRD, who coordinated workshops to understand future prospects for palm oil in the two countries. In Cameroon, there is a significant very small-scale oil palm sector, while much of the expansion in Indonesia is dominated by industrial mills controlled by companies. 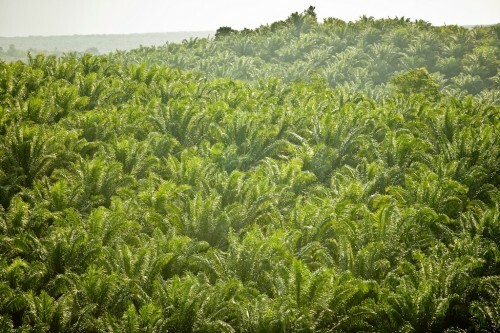 In Sumatra, small-scale growers’ palm plots range in size from two hectares to more than 100 hectares. Some growers have contracts with companies, which provide them with seedlings and fertilizer and buy their palm fruit at harvest time. Others operate more independently. Some are dedicated to intensive palm cultivation, while others combine palm with other crops, fish farming or small-scale commerce. Income also varies widely. In a country where the average annual income is about US$1,400, Sumatran farmers reported earning between US$800 and US$8,000 from a two-hectare plot of oil palm. In Cameroon, some plantations are owned by smallholders, who may have as little as one hectare of palm. Others are medium-size operations owned by wealthier city dwellers, such as bankers or government officials, who have political connections and access to subsidies, Levang says. Although they represent only 10 percent of planters, they own two-thirds of the rural area planted in oil palm, he says. With such a diversity of players in the palm industry, it is not surprising that people understand environmental, social and economic sustainability differently, Bessou says. The way in which farmers view sustainability differs from the perspective of the international non-profit organizations that helped draw up the environmental, social and economic criteria for certification. Those organizations tend to focus on the three pillars separately, with some concentrating on the environment, while others specialize in economic aspects. For farmers, however, environmental, social and economic impacts of palm production are intertwined. In deciding which forests should be conserved, for example, a large environmental organization looks at factors such as biodiversity and carbon regulation, which are important for the planet as a whole. Local farmers, however, value the forest mainly as a source of necessities such as food, building materials and fuel wood. Social and economic sustainability also look different from a global standpoint and the farmer’s perspective. Local people, however, tend to think of sustainability as ensuring their children’s welfare—which might mean clearing one more hectare of forest to plant food for the family or expanding a plantation to increase family income to pay for a child’s university education, Bessou says. Understanding those different viewpoints is crucial for better defining the “best practices” called for in certification guidelines such as those used by the RSPO, the researchers say. “To make progress towards sustainability, more effort must be made to understand these different perspectives and to find ways to advance toward a common goal of sustainability while addressing the views of that many different stakeholders,” Pacheco says. So what would a more sustainable future look like? To investigate that, the researchers held workshops in both countries with palm growers and others involved in the palm oil industry, using a technique called participatory prospective analysis to look at scenarios for the future. “Just bringing people together and having them talk about their future, not about past problems, was very successful,” says Levang, who oversaw that part of the study. That wasn’t easy at the start, however. On the first day of the Cameroon workshops, industry representatives sat on one side of the room and smallholders on the other. “They started getting angry at each other,” Levang recalls. Workshop participants proposed ways to improve environmental practices and the economic relationship between smallholders and the industry. The researchers found that smallholders’ use of fertilizers and pesticides varies widely, for example, in some cases far exceeding recommended amounts. “There is a lack of knowledge of agronomy,” Bessou says. To determine the right kinds and amounts of fertilizers and pesticides to use on their crop, farmers need specific recommendations that are adapted to their growing conditions and economic possibilities, as well as “training so they can understand the recommendations and apply them consistently,” she says. Improving the relationship between growers and the palm industry is also important for improving sustainability, the researchers say. The workshops in Cameroon demonstrated that “trust comes from transparency and from participatory decision making,” Levang says. Cameroon growers resented having contract terms imposed on them by large plantations or processing plant. But when they joined industry representatives in the workshop and drew up contracts together, they devised provisions related to price and fruit delivery that were acceptable to all. In Indonesia, companies sometimes provide smallholders with seedlings and fertilizer. Once the trees start producing, the farmer must sell the fruit to the company to repay the advance. Contract terms, including interest rates, are not always clear, however, and farmers sometimes go into debt and risk losing their land. “There is a need for greater transparency about the pros and cons of contracts, and for basic training on interest rates,” Bessou says. The researchers recommend encouraging smallholders to form associations, which would give them greater leverage in negotiations. That would also make it easier to provide training tailored to local needs. To follow up the work in Sumatra and Cameroon, the researchers hope to expand their study to other areas and to compare results from certified and non-certified plantations. Consumers—who create the increasing demand for products made with palm oil—also have a role to play in reducing the impact of palm cultivation on tropical forests, Bessou says. She and her colleagues hope their research will provide information that growers and industry representatives need to move in that direction. For more information on this topic, please contact Pablo Pacheco at p.pacheco@cgiar.org or Cécile Bessou at cecile.bessou@cirad.fr. This research was supported by the French National Institute for Agricultural Research (INRA) and the Research Institute for Development (IRD), with PT SMART as a field partner. This study is part of the Sustainable Palm Oil Production (SPOP) Project.